The launch of a T version of OnePlus handsets has become an annual event, and a new leak gives us a good idea of what to expect from the upcoming OnePlus 6T. 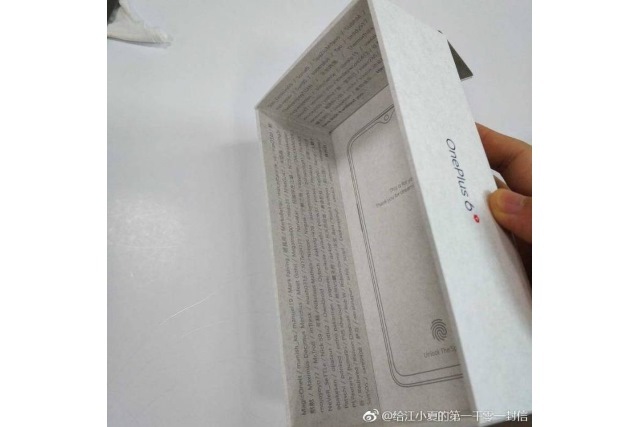 What purports to be images of the retail box for the OnePlus 6T has been shared on Weibo and -- assuming it is genuine -- it gives us a glimpse of what to expect from the upcoming handset. We can see that there appears to be a smaller, redesigned notch, and also a fingerprint reader that's built into the screen. Weibo user Laobaotech has shared a number of images of the alleged OnePlus 6T packaging, and while this does not give us a look at a render or photo of the phone, there is a line drawing of it. This image shows that the notch present on the OnePlus 6 has been reduced in size for the OnePlus 6T, and it has also been made more tear-shaped. This is something that will be welcomed by users as it reduces the impact the notch has on Android's status bar. But while this is interesting, what is perhaps more exciting is the suggestion that the OnePlus 6T's fingerprint reader will be built directly into the screen. While the OnePlus 5 featured the fingerprint reader in the front home button, the OnePlus 5T and the OnePlus 6 moved it to the rear to allow for a larger screen -- something that is not to everyone's taste. The box artwork for the OnePlus 6T appears to show that it has now been integrated into the screen. While it's not 100 percent clear whether these photos are genuine, the same Weibo account has been responsible for a number of other accurate leaks in the past. We'll just have to wait and see if it's right this time around.